As it’s Organic September, I’ve made this indulgent chocolate milk with 100% organic ingredients. I always buy organic milk and usually buy organic chocolate. However, organic cream is harder to get hold of, so that’s a much rarer item in the Tin and Thyme household. The Soil Association are asking everyone to make a small change in their buying habits for #OrganicSeptember; I bought some organic cream. I have a brand new gadget in my kitchen. It’s the new Optimum G2.3 platinum series induction blender. I’ve been testing it out on a few things and blitzing a bar of solid chocolate to make this smooth chocolate milk was one of them. It did it, of course. I’ll be posting my review of this bit of kit in a week or two’s time, so look out for it. This chocolate milk may be indulgent, but if you have it in small measures, it’s not really so bad. The amount I’ve given in the recipe gives 3 small 125ml cups or glasses, but if you want to go to town you could make two larger drinks or even one super shake. Go easy though, because a little goes a long way. If you prefer to have your chocolate milk hot, then forget the blitzing method and melt the chocolate in a pan with the milk and cream over a low heat, stirring from time to time. Sit back, put your feet up and enjoy. 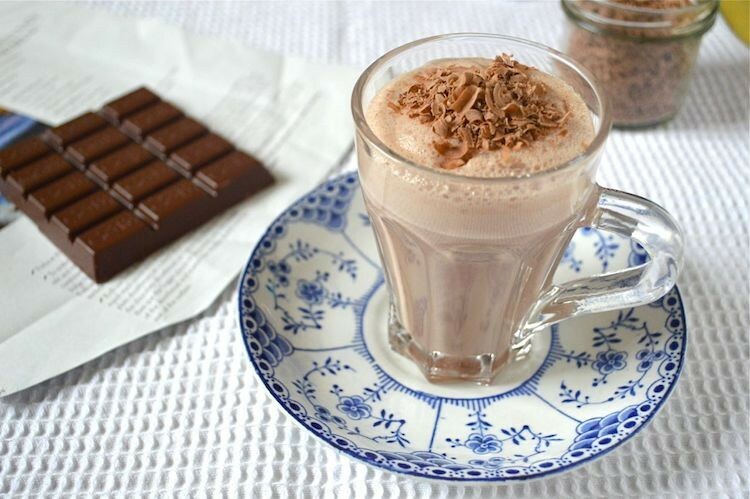 A rich and indulgent cold chocolate milk drink made with solid chocolate. Break up the chocolate roughly. Place all of the ingredients into a power blender and blitz for 60 seconds. I used the small jug of my new Optimum G2.3. Pour into 3 small glasses and decorate with a little grated chocolate if liked. Use dark chocolate for a richer and less sweet drink. Add a slug of whisky for extra indulgence. 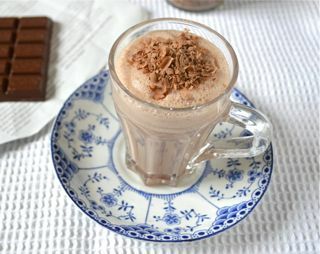 For a hot chocolate, simply melt the chocolate in a pan with the milk and cream over a low heat, stirring from time to time. I think my trouble is I’m far TOO indulgent of my inner hedonist, but this DOES look fabulous! Ooh chocolate cookie syrup sounds interesting Sarah. You’ve got me trying to imagine what that might be like. Thanks Nadia. It’s rich, creamy and very naughty, but it just has to be done once in a while. Ah the new Froothie sounds brilliant, and anything that makes a good chocolate milk is good in my book. I love G+B’s organic, so much tastier than non-organic chocolate. I’m still trying things out with the new Froothie. It’s quite different to my old one. And yes I do agree, G&B is one of my favourites. There’s no better hot chocolate than that make with actual chocolate. Yum!!! Shared. Who could ever pass up a sip of chocolate! Organic September was a fabulous initiative and I agree, organic cream can be very hard to track down. Worth it though, to make this decadent chocolate milk, which although we are only just into October I would definitely have warmed. Gorgeous treat especially with bonfire night coming up! This chocolate milk looks really welcoming especially as the weather has turned so cold. How are you getting on with that new blender? Is the induction motor significantly different/better than normal ones? Hi Ben. Thanks for asking. I’m still trying to figure it out properly before I do my review. It’s a good blender and the motor is significantly quieter than my Optimum 9200A, but it isn’t as powerful. It’s fine for blending lots of things. I’ve made kale and carrot smoothies with great success, but it does take a bit longer 90 seconds as opposed to 35 seconds in the 9200A. I’ve not had so much success with blending things like orange peel into smoothies. This turns out to be quite grainy. It all depends on what you want your blender for.